I’ve been poring over my September/October issue of The Horn Book; it includes Jacqueline Woodson’s Legacy Award acceptance speech (in which she talks about brown bodies, black bodies, white bodies, our bodies) and an overview of her body of work, including her picture book Visiting Day. Visiting Day tells the story of the one day each month when a girl and her grandmother get to visit the girl’s father in jail. James E. Ransome's beautiful illustrations show the step-by-step preparations, the journey, the brief but beautiful reunion, and the start of the long waiting process again as grandmother and granddaughter return home from the prison. The book drives home how lonely his family is for him. You can feel them aching for him to be home. What must it be like to have no choice but to be so far away from someone so close to you? What must it be like to have to work so hard to bring the bodies of your family together? In July I was in Philadelphia for the Podcast Movement conference and visited the Eastern State Penitentiary. I could write 500 words on that visit alone but I won’t; just check it out, especially if you’ve read Foucault’s Discipline and Punish. On exhibit in the prison yard is a bar graph sculpture depicting incarceration rates for every nation in the world. The US is at the top, heads and shoulders above every single other country. The second highest incarceration rate is Rwanda and they’d have to work hard to get close to the US rate. Eastern State Penitentiary (and my brother in the foreground whose idea it was to visit the site). If you look closely at the sculpture you can see (each column represents a decade) how drastically incarceration rates have jumped since the 70-80 years of the last century. Which means that there are likely a lot of children whose parents were, are, or will be in jail. Two weeks ago Ellen Stackable (from my home state of Oklahoma), was named a CNN Hero. Ellen is the founder of Poetic Justice, an amazing organization that offers restorative writing workshops to incarcerated women, helping them find a voice, hope, and power to change. Oklahoma has the highest female incarceration rate in the nation and, statistically, we know that incarcerating women impacts a huge number of children as well. Those of us who have the privilege of being close to loved ones may take for granted how powerful proximity is. Just how precious are the moments we spend in the company of those we love. Reading Visiting Day helps me imagine what it’s like for others. Helps me empathize and learn. 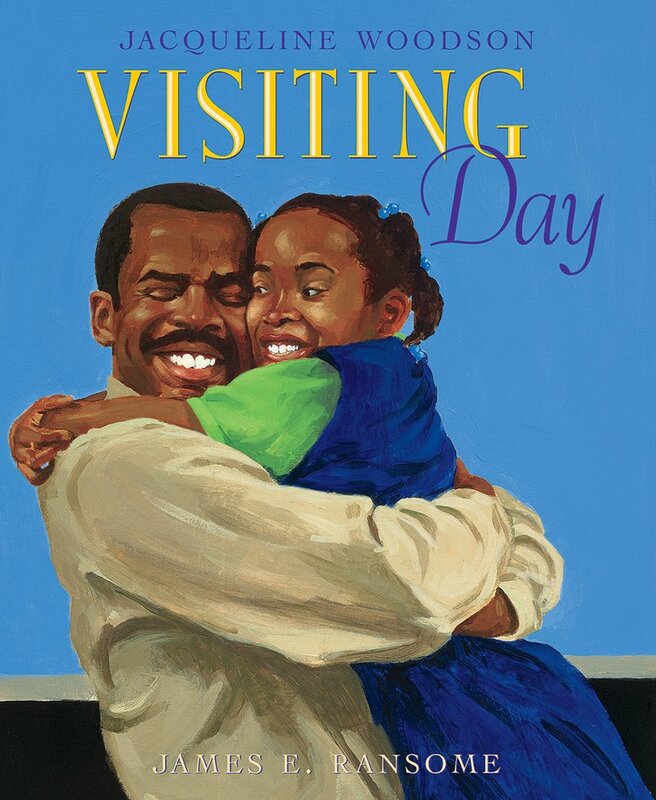 Like so many others, Woodson writes that “art has helped me get through the pain--of everything.” There are many other books - like Visiting Day - that speak to the experience of a family member in prison. It is my hope that the wealth of powerful storytelling by incredible writers and illustrators can bring some healing to the children whose lives are unfairly impacted by such severe separation. That art can help them get through the pain. Here is a long List of Children's Books Dealing With Incarceration.